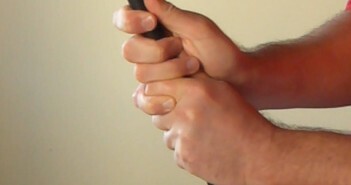 In Golf Swing 104e – Setup: The Perfect Golf Grip – Grip Pressure, we explain why your grip pressure should be light, and we discuss how this helps you to keep your wrists tension-free and the benefits that this offers in Soft Wrists. Many students, however, still struggle to find the right grip pressure – most grip the club way to firmly, we very rarely meet a golfer who’s grip is too light. The result is a loss of club head speed, control and rhythm – gripping the club firmly might feel like it gives you more control, but it’s quite the opposite! This article will give you some ideas that you can try in order to find the right grip pressure for you. Imagine that your arms don’t have any muscles or bones in them, that they’re just floppy pieces of old rope. Now turn from side to side to swing your arms around your body, like a child’s toy. Release all the tension and let your arms whip around – you can generate quite a lot of arm speed this way. Now grip a golf club and try to feel the same looseness in your hands and wrists. When you swing, you’ll be amazed at how much club head speed you can create, and at how solidly you can hit the ball. 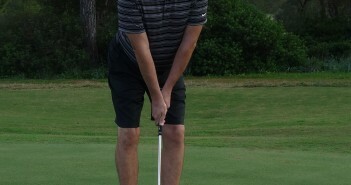 Flip the golf club over so that you are holding the shaft near the club head, and take your normal grip. You won’t be able to grip the club firmly like this, since the shaft is too thin. It will feel like the club is just resting in your hands. Make a few swings and make the club grip whoosh through the air – trying to get the loudest whoosh at or just after the point where the ball would normally be. Now flip the club back and grip it properly. Swing the club and hit some balls while looking for the same feeling. You’ll really be able to feel the weight of the club swinging, as if the club is doing all the work – just as you should. You should feel that your grip is lighter, and your rhythm will probably be better too. Take your grip on a golf club as normal, without wearing a glove, and ask a friend to hold the club head and gently pull it away from you until it lifts your arms. Now gradually lighten your grip until the golf club begins to slip through your grip, and make a mental note of that particular grip pressure. Make a few practice swings, gripping the club at that pressure and trying to keep the pressure constant throughout the swing. If you’re unable to maintain that pressure while still holding on to the club, increase it very slightly. Find the minimum grip pressure that you feel you can maintain through impact. Take your grip on a golf club as normal, but move your grip up the shaft so that the little finger (“pinky”) of your left hand (top hand, for a right handed player) is off the club. Make some practice swings. It should feel like you are barely holding the club. The club should feel heavy, with very little tension in your wrists – like the club is doing all the work. Now make some swings with your normal grip, looking for the same feeling. Feel the weight of the club swing, and maintain the same grip pressure throughout. Take your grip as usual and hold the club up vertically in front of you, the club head pointing at the sky. Let the club slip through your fingers and then tighten your grip just enough to stop it falling. Weaken the pressure again to the point where the club feels like it is about to slip. Now lower the club until it is horizontal. 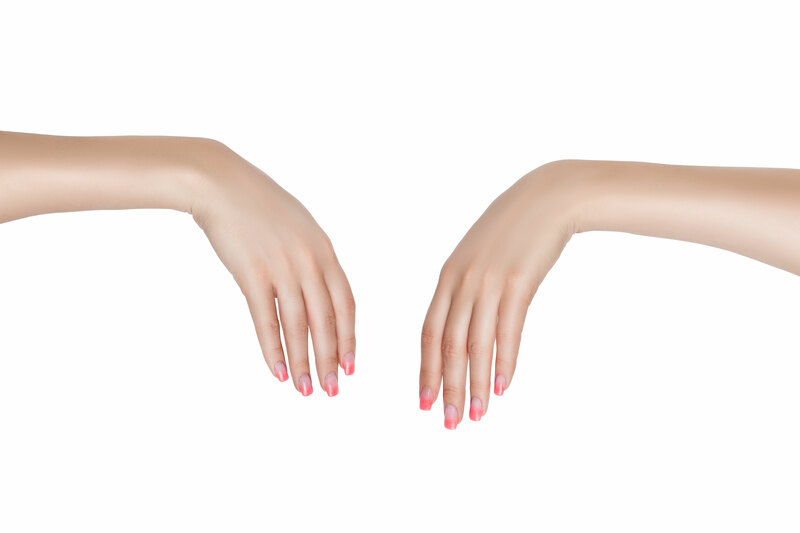 You’ll feel a little pressure building in the last three fingers of your left hand, and the middle and ring finger of your right hand (for a right handed player). This is exactly the right grip pressure. This is a great way to feel the proper grip pressure and improve your awareness of the correct pressure points in the grip. In reality, your grip pressure will increase as the golf club accelerates through impact and pulls against you, but it should feel like you are maintaining a constant pressure. Footnote: Keep your grips clean! Grease and grime get embedded in your grips every time you play, and after a few rounds they will lose their “tackiness”, you’ll have to grip the club more firmly and your swing will suffer. If you’re serious about your golf, clean your grips after every round, and have your clubs regripped regularly (after every 50 rounds or so). This may seem like a lot of trouble, but practising with poor grips will subconsciously teach you to grip the club more firmly, and it will make your golf swing worse! 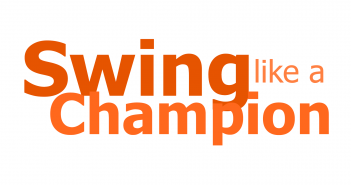 » Play Like a Champion – Additional golf instruction.